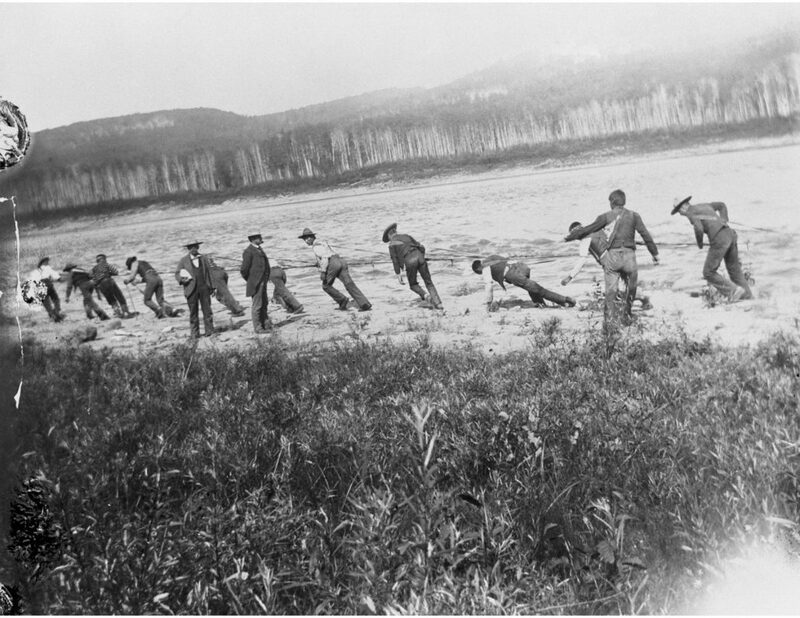 From Fort Yukon, Robert Campbell and his men hurried up the Porcupine River to join Mr. Alexander Hunter Murray, who was already on his way to Lapierre House with the Fort Yukon boats. Campbell is now heading upriver toward the range of hills that lie between Lapierre House and Peel’s River House [now Fort McPherson], the northernmost HBC post close to where the Mackenzie River flows into the Arctic Ocean. The Porcupine River itself runs in a big loop to the north, following the west side of the range of mountains. At Lapierre House, or in the vicinity of that place, it turns south and flows into the Yukon River close to the location of Fort Yukon. I believe Fort Yukon was actually in what was then Russian Territory, which would mean it was in Alaska. Monday 9th June . Got some meat made into bales and packs made and though the water is still high we come off at 11 a.m. Mr. Hardisty accompanied me to the camp. We had to camp at 4 p.m. on the first spot of dry ground we saw along the river, it being everywhere overflown over its banks. Who knows what extent of country it covers. Tuesday 10th June 1851. Come off at 6. We had no trouble to find a dry place to kindle fire on to cook breakfast. Strong though current be we reached Mr. Murray’s camp and met a warm reception and good cheer. It is but seldom that two Scotchmen meet in this wilderness. The water is falling a little — may it continue to do so. Wednesday 11th June 1851. Sent Perrot back to the Fort for Hector for whom we have now to wait. The water fell several feet. Thursday 12th. Hector and the Indian arrived about 2 p.m. and we come off at once. Mr. Murray with the sail and us with the oar. Camp at 8 pm. on a fine (prairie). Friday 13th. Came off at 5 a.m. tracking, pulling and rowing. Delayed a third of the day for the Youcon Boat not having no guide or none knowing the river. Camped at 8. This [is] tormenting. What the transcription in Robert Campbell’s Journal #2 said is: “This tormenting.” I think Campbell is referring to the flies that tormented the men in their campsites, as you will see when we proceed further. Saturday 14th. The same kind of travelling and weather. Sunday 15th 1851. Delayed 5 hours repairing and patching the Youcon Boat — thunder and showers and flies. Monday 16th. The same kind of travelling and saw 2 doe moose and young today. Camped above Egg Rock. Tuesday 17th. Yesterday and today we have been passing through what they call the ramparts — rocks and steep banks along the river — but good tracking and but little current. We passed the junction of a cross river in the afternoon, entering from the north on the right. We saw 3 moose along the [river] and killed 2, one of which we wanted for fresh meat and the other I could not prevent them from killing though hardly any of it was taken from where it fell. Flies tormentingly annoying. I knew that somewhere in his journals Campbell had told us what “ramparts” were. There it is: “rocks and steep banks along the river.” It sounds as if he learned what the words meant on this journey, as he didn’t use them coming down the Yukon River, but did on his return journey to Fort Selkirk later that summer. Wednesday 18th June 1851. In different places along the river we saw 8 moose today, all of which we might kill and it was with great difficulty I could keep the people from doing so. In fact one was killed, a young one, by one of Mr. Hardisty’s men. The flies which are in billions are no doubt driving them to the river. We camped in the upper ramparts — warm and sultry. Thursday 19th. Two more were seen on either side of the camp last night and 8 and a reindeer [caribou] before breakfast this morning. The last was the only one we tried and failed to get through bad shooting. This makes 19 animals seen since yesterday morning, and a beaver — excessive warm the forenoon and drizzling the afternoon. Camped early. Passed the entrance of a river on either side, Crow on the left and Rapid River on the right. Flies like a cloud in the forenoon but disappeared partially on the afternoon. Friday 20th June 1851. Cold with head wind and no flies. Come on well, the water rather stronger and still passing through the ramparts – ie. steep rugged rocks on either side. Saturday 21st. The same kind of weather. Saw no animals. Camped above the ramparts. Mountainous country. Fine blue mountains seen in the distance. Sunday 22nd. Flies bad again today. We saw two moose on the river but could not get a shot at them. The river very crooked. We are now two days coming along the Carribeau [Caribou] Mountains. Monday 23rd. Mosquitoes tormenting us all day. Passed the entrance of North or (Letter Carriers) River. 4 moose were seen today, the first killed, the other merely seen. The first killed by Mr. Murray and myself; another missed by the men. We had good tracking all the afternoon. Tuesday 24th. Had a heavy shower which detained us about two hours in the forenoon. Delayed a little again at the Grand Blanc camp and we camped lower end of the north of Grindstone Bend. Flies abundant. Wednesday 25th. Camped at the foot of a fine hill. 2 deer were killed today, which caused some delay. Thursday 26th June 1851. Had a shower and thunder this afternoon which obliged us to camp earlier. It poured down rain almost the whole night. Friday 27th. Breakfasted above the junction of rivers gens des fou (Mad People River) — rain– thunder again. Large bear killed where we camped. Plenty flies. Saturday 28th. About noon it with thunder and lightning began to rain in torrents, which obliged us to lay by with the boat. Mr. Murray and myself cam off cross land to the fort or House and reached it in 1 3/4 hour. Found Mr. McKenzie well with Indians (illegible) for Mr. Murray to assist him to cross the Mountains. LaPierre’s House to the Porcupine by Bell’s River is 30 miles: This part is all plain sailing. The river is narrow but deep, and there are no obstructions to be met with. From the mouth of Bell’s River to the junction of the Porcupine and Yukon Rivers is 400 miles. Old traders have said that the Porcupine is shoal in several places, but there are no boulders or rapids, and no difficulty will be experienced in reaching the mouth of the Yukon. The Porcupine has always been known as a great place for game, principally moose, deer, and bears. So it is 430 upriver miles from Fort Yukon to Lapierre’s post. That’s quite a distance, and so we can see how it took so long to get between the two places. Coming downriver, of course, was much easier and faster! On [Alexander Kennedy] Isbister’s final journey before leaving the district he managed to cross the Continental Divide [from Peel’s River post]. This occurred in March of 1841, when the post was short of food. Three Kutchin Indians arrived at the post with the news that the Indians west of the mountains had plenty of meat in their camps. Bell dispatched Isbister and three men to accompany the Indians back to their camp and trade for provisions. The followed the valley of the Rat River to the river’s source, which was a collection of small ponds in a mountain meadow. Because of the ice and a thick snow lying on the ground, Isbister was unable to distinguish the area as the head of the Rat River. Therefore, when he came to another small river less than a mile away, which we know as the Bell, Isbister assumed that he was still following the Rat. In times of high water the sources of the Rat and Bell rivers mingle, and one can pass from one river to the other without a portage. This is remarkable, because the Bell flows westward towards the Yukon River and the Bering Sea, while the Rat heads east to the Mackenzie and thence to the Arctic Ocean. 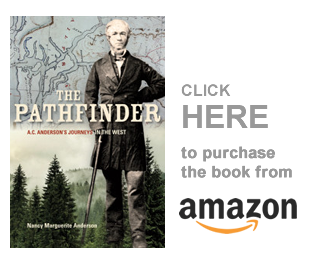 Isbister had found what the Hudson’s Bay Company so earnestly wanted, a water route through the mountains, but he did not know it, as it lay hidden beneath his snow shoes.